International commercial contracts in the context of increasing globalization of the national markets have posed some of the most difficult questions of the legal theory as developed since the emergence of nation states; those are, whether it is possible or desirable to allow international commercial contracts to be governed by the law merchant or, in its medieval name, lex mercatoria, a body of rules which has not been derived from the will of sovereign states, but mainly from transnational trade usages and practices, and to what extent those rules should govern transnational transactions. The traditional approach of legal positivism to the questions maintains that law governing contracts containing a foreign element should be a national law which will be determined according to choice of law rules. However, the particularities of cross border trade yield unsatisfactory results when the rules essentially designed for the settlement of domestic disputes or national laws pertaining to international economic relations, but developed under the influence of a certain legal tradition, are tried to be applied. New solutions are needed to overcome the special problems of international trade between merchants from different legal systems. In that regard, while the international commercial arbitration which has been freed from the constraints of the domestic laws is an important step, the courts generally applying the principle of party autonomy which allows parties to designate the law that will apply to their transactions have proved insufficient due to the positivistic influence on the conflict of laws rules of most countries which has limited parties' choice of law to the national substantive laws. The problems created by those inconsistencies and divergences have been felt more strongly in the European Community which constitutes an internal market by integrating the national markets of Member States into a single one. The present paper is an attempt to search for answers to those questions with a special emphasis on the situation in the European Community on the basis of the idea that law as a servant of social need must take account of the far reaching and dramatic socio-economic changes. First of all, the idea of law as a body of rules solely emanating from the power of a sovereign is contradictory to historical evidence. Therefore, the first part of this paper is devoted to the examination of the roots of those non national rules and their evolution from the position as the applicable law to international commercial contracts into the marginalization of them by the notion of sovereignty and the emergence of nation states in the course of history. Moreover, the relationship between those rules and other laws, authorities and the conflict of laws theories will be analyzed during the historical discussion. Given the fact that modern lex mercatoria differs from its historical counterparts in respect of character and sources, but contains inherent similarities at the same time, the second part of the paper will try to present the elements of modern law merchant following a brief discussion on its autonomous and imperfect nature. Indeed, the comparative and substantial approach to international commercial contracts utilized mainly by legal doctrine and arbitral tribunals has immensely contributed to the augmentation and coherence of modern law merchant as a whole along with the emergence of new elements such as non binding codifications of general principles or trade usages and publication of arbitral awards. Then again, the traditional underpinnings of lex mercatoria continue to be reflected in the contractual nature of the modern law merchant which has shown that the legitimacy of each element emanates from its adoption by international mercantile community through business practice. 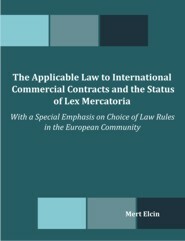 In the last part, while searching for the place where modern lex mercatoria stands, the paper aims to focus on the law applicable to cross border commercial contracts in the domestic courts within the European Community which has become more susceptible to the problems associated with those transactions due to the increased commercial activities between merchants from different Member States. In order to enable a comparative approach, before starting with the analysis of the rules in the European Community, a brief overview of the situation in the United States and Latin America as well as the presentation of the arbitral experience with modern lex mercatoria will take place. With the discussion on the recent developments in the European Community with regard to modernization of choice of law rules and, to a lesser extent, European contract law codification, the paper will reach to the conclusion and suggest its position to the triad of relations between the choice of law rules, substantive rules and modern lex mercatoria.